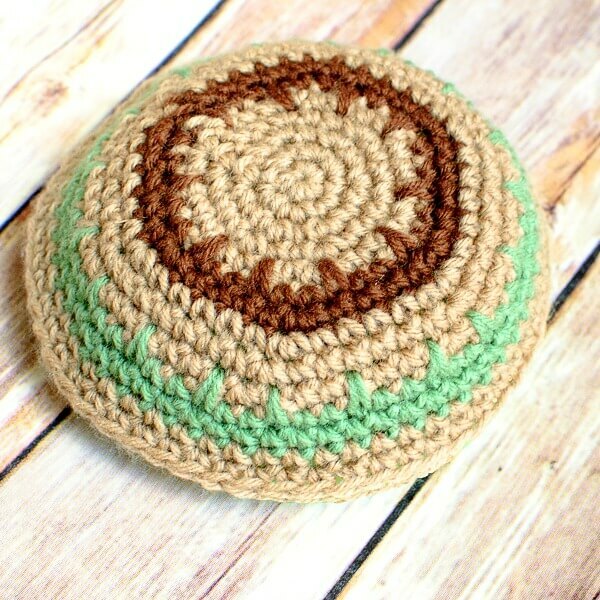 I was recently asked to design a crochet yarmulke pattern and of course I wanted to share the design with you as well! I chose a sport weight yarn so that it wouldn’t be too hot or heavy and added some long single crochets to give it a little interest. Long single crochet (Lsc): Insert hook into specified stitch and draw up a loop to the height of the row being worked, complete as single crochet (the Lsc takes the place of the next stitch in the current row). With CA, make a magic ring (as an alternative to the magic ring, you can ch 4 and join with a slip stitch in furthest chain from hook to form a ring). Round 5: Ch 1, work 2 sc in same st as join, 1 sc in each of the next 3 sts, *2 sc in next st, 1 sc in each of the next 3 sts, rep from * around, join, drop CA — 30 sts. Round 6: Join CB, ch 1, work 2 sc in same st as join, 1 sc in each of the next 3 sts, 1 Lsc in next st 1 round below, *2 sc in next st, 1 sc in each of the next 3 sts, 1 Lsc in next st 1 round below, rep from * around, join — 36 sts. Round 7: Ch 1, work 2 sc in same st as join, 1 sc in each of the next 5 sts,*2 sc in next st, 1 sc in each of the next 5 sts, rep from * around, join, fasten off CB — 42 sts. Round 8: Pick up CA, ch 1, work 2 sc in same st as join, 1 sc in each of the next 6 sts,*2 sc in next st, 1 sc in each of the next 6 sts, rep from * around, join — 48 sts. Round 9: Ch 1, work 2 sc in same st as join, 1 sc in each of the next 7 sts,*2 sc in next st, 1 sc in each of the next 7 sts, rep from * around, join — 54 sts. Round 10: Ch 1, work 2 sc in same st as join, 1 sc in each of the next 8 sts,*2 sc in next st, 1 sc in each of the next 8 sts, rep from * around, join, drop CA — 60 sts. Round 11: Join CC, ch 1, work 1 sc in same st as join, 1 sc in next, 1 Lsc in next st 1 round below, *1 sc in each of the next 2 sts, 1 Lsc in next st 1 round below, rep from * around, join — 60 sts. Round 12: Ch 1, work 1 sc in same st as join and each st around, join, fasten off CC — 60 sts. Round 13: Pick up CA, ch 1, work 1 sc in same st as join and each st around, join — 60 sts. Round 14: Ch 1, work 1 sc in same st as join and each st around, join — 60 sts. 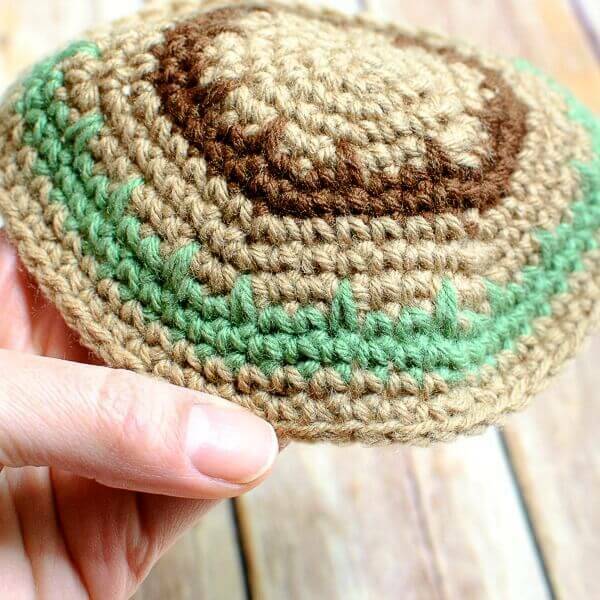 If I sent you a picture of a kippah with lettering would you be able to make me a pattern and at what cost? If not, do you know where I can get one made? Hi Diedra 🙂 Unfortunately I do not take on custom projects. Perhaps your local yarn store would know of someone that can work with you on your idea? Kara, you did a beautiful job on this! My neighbors are Jewish and are always helping with our dogs. This would be a great gift for them…thanks! What a thoughtful gesture that would be! Thank you, my step mother is a Rabbi and this would be a special gift I can make for her. Wish I’d seen it before Mother’s Day. I actually made myself one for my wedding. Really nice job. I love that is almost has a textured look! Thanks for this pattern! I have been looking for one to crochet with little success. I plan to make some for Muslims in our community. Glad you find it useful, Pat! Before you do, make sure you use the style which Muslims use. They might take offense if the skullcap looks like a Jewish one. This is very nice. As I am not Jewish, what is a yarmulke? Thank you for your patterns. A yarmulke is a traditional head covering that Jewish men and boys wear. As I replied to Claire, there is no requirement to be a man or boy. Anyone, of any gender, religion (or lack thereof), any age may wear one. Covering one’s head = respect for the presence of God. The head covering is typically worn during Jewish worship services (so if you’re invited to someone’s bar or bat mittzvah, for instance, you are likely to be offered one) and at Jewish funerals. However, there are individuals who wear one all the time. How can so many Christians NOT know about Jewish customs and rituals. If you know Jesus, you would know something about the religion he followed, including the newer ones – just as I knew that Catholics didn’t eat meat on Fridays and then the Pope said it was ok to eat meat but some still followed the old rules. The more we know about each other the better relations can be. Education can do wonders. My comment is always: I thought you knew Jesus. I have never heard of this before, what do you do with it? I did not know that. Thank you, Claire! There is no requirement to be a certain age or a certain gender; any human being of any age or gender or religious affiliation (or non-affiliation) may wear a kippah (Hebrew) / yarmulke (Yiddisih) / skullcap. Covering one’s head = respect for the presence of God. Perhaps you were thinking of a tallit (Hebrew) / tallis (Yiddish) / prayer shawl: only Jews over the age of 13 wear one, and it’s not a “requirment” to wear one. Wearing a prayer shawl fulfills the commandment to wear “fringes” on the “corners” of one’s garment throughout the generations (Num 15:38 ffl). Jewish children under the age of 13 are not required to fulfill any of the commandments for themselves. Although they look the same, they are different. But just look at the clergy who are Christian – including the Pope – to see them wearing skullcaps. 21st Century – it’s time for Christians to know more about the religion and customs of Jesus. Nancy A, you must leave in a very isolated part of the world. Time to use your computer to find out more.